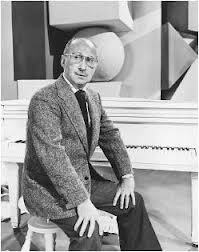 This week's Friday Night is Music Night is Come Fly with Me: A Sammy Cahn Tribute. It will be introduced by Don Black and broadcast on Friday 21st June at 8:00 pm with the BBC Concert Orchestra, conducted by Broadway maestro Larry Blank, plus guest singers Curtis Stigers, Lance Ellington, Alison Jiear and Joe Stilgoe. The late, great lyricist Sammy Cahn (he died in 1993) wrote over sixty hit songs for Frank Sinatra alone, including 'Come Fly With Me','All the Way', 'Call Me Irresponsible', 'High' Hopes and 'Three Coins in the Fountain'. He was nominated for an Oscar 23 times and won 4. Doris Day, Nat King Cole, Danny Kaye, Bing Crosby, Dean Martin all recorded and had hits with his songs. Contemporary artists including Michael Buble, Jamie Cullum and Diana Krall still include his songs on their current albums.